New Aberdeen-Amsterdam route takes off! 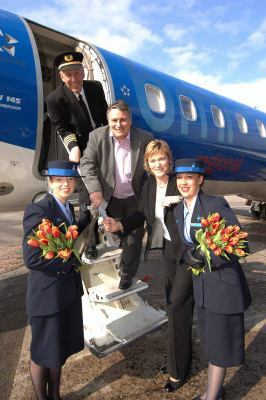 Paul Yarnold (chief pilot), Crawford Rix (MD bmi regional), Kay Drummond (media and communications manager), from left to right, Kristen MacLennan (cabin crew) Nicole Hanton (cabin crew) The number of international passengers jetting out of Aberdeen is set to increase following the launch of a new direct bmi regional route to Amsterdam. This week saw the UK’s most punctual regional carrier commence a new service that departs for Amsterdam three times daily Monday to Friday, once on Saturday and twice on Sundays. Operated by bmi regional’s all jet fleet of Embraer aircraft, the flight schedule is conveniently timed to meet the needs of Aberdeen’s growing numbers of business passengers and is designed to allow for a full working day in Holland’s capital. Managing director of bmi regional, Crawford Rix commented: “Amsterdam is a popular business and leisure destination as the national, financial and cultural capital of the Netherlands, but it’s also an important international gateway for the North East of Scotland. “Aberdeen Airport is achieving record growth in passenger numbers as we continue to build an ever stronger network of national and international routes. A full service airline operating a range of domestic and international routes from key regional airports, bmi regional is officially the best airline for punctuality in the UK and renowned for excellent in-flight service and frequent flyer benefits. All flights offer the speed and comfort of an all-jet aircraft service and separate business and economy class seating on board with complimentary refreshments. Business lounge facilities and range of check-in options, including online check-in, also ensures speed and efficiency at the airport. For further information or to book, visit www.flybmi.com or call 0870 60 70 555.